Few stories have captured the hearts of Latter-day Saints like the account of the rescuers from the Salt Lake Valley carrying members of the Martin Company across the freezing Sweetwater River. In "The Martin Handcart Company at the Sweetwater: Another Look," Chad Orton shares his thorough research on the rescue and its aftereffects on the men involved. His work gives a more complete history of this event and corrects some common misconceptions. Most Latter-day Saints know that Joseph Smith and his followers drained a disease-infested swamp to make Nauvoo, Illinois, habitable. But nobody today understood much about how they did it until three BYU engineering professors and one of their graduate students combined conventional historical research with a modern engineering analysis to explain this feat. A description of their study is found in "Transforming Swampland into Nauvoo, the City Beautiful: A Civil Engineering Perspective." Valerie Atkisson, a Mormon artist living in New York, expresses her interest in her family's history by creating artworks about them. 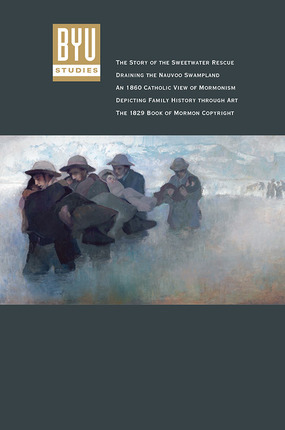 An article by Josh E. Probert examines the meanings of her artwork and how that art integrates Mormon themes with the world of Contemporary art. Full-color photos accompany the article. Renowned scholar Mark A. Noll, University of Notre Dame, offers an intriguing look at what the Catholic Church was saying about the Mormons in 1860. Noll examines "Mormonism in Connection with Modern Protestantism," an article that appeared in a notable Italian journal in May 1860. BYU Studies presents the article in its first English translation as well as Noll's perceptive analysis of the document. In a review essay of Richard Bushman's Joseph Smith: Rough Stone Rolling, David Whittaker recognizes the importance of this biography and informs readers of the difficulty of working with extant sources on Joseph. Whittaker warns that the book is not for the "historical tourist," but rather for those who are willing to explore new perspectives on the Prophet.